McKinney residents Jeremiah Hammer and Alyssa Summey met on the downtown square three years ago. And now on Sept. 27, they’ll exchange marriage vows in the heart of where they met during one of the city’s most vibrant and well-attended celebrations, Oktoberfest. “Our beginning was on the Square, so it seemed rather perfect for our wedding to be on the Square, too. We want to celebrate with the people of the town we love,” Alyssa said. The couple’s first meeting happened during Second Saturday festivities in 2010. Walking past Alyssa’s studio (then located on Virginia Street), Jeremiah struck up a conversation with her mom who was greeting passersby. The just-introduced pair wound up chatting late into the night over a Guinness and pork rinds at The Pub. They’ve been inseparable ever since, and almost a year ago (October 2012), Jeremiah proposed to the love of his life, on her birthday, while sitting in that same booth at The Pub. The destined-to-find-love pair’s story actually began years before their first meeting, as they discovered during their early conversations. In 1995, Jeremiah’s family moved to Texas to start a company, Mannatech, Inc. And in 1997, Jeremiah headed to Europe for a year-long Shakespearean class on a University of Dallas campus in Italy. Coincidentally, in 2001, Alyssa lived on the same Italy-based UD campus for a year of studying abroad. Upon returning home and finishing her first degree in biochemistry, Alyssa went to work at the very company that had brought Jeremiah’s family to Texas (Mannitech). In 2008, after years of moving around the DFW metroplex, Alyssa settled in McKinney. Jeremiah, too, spent the better part of 15 years moving around the metroplex, settling in McKinney in 2010, one month before their paths connected at her downtown McKinney office. The couple can be found just about any day of the week somewhere downtown when not at their home a few blocks north of the McKinney square. 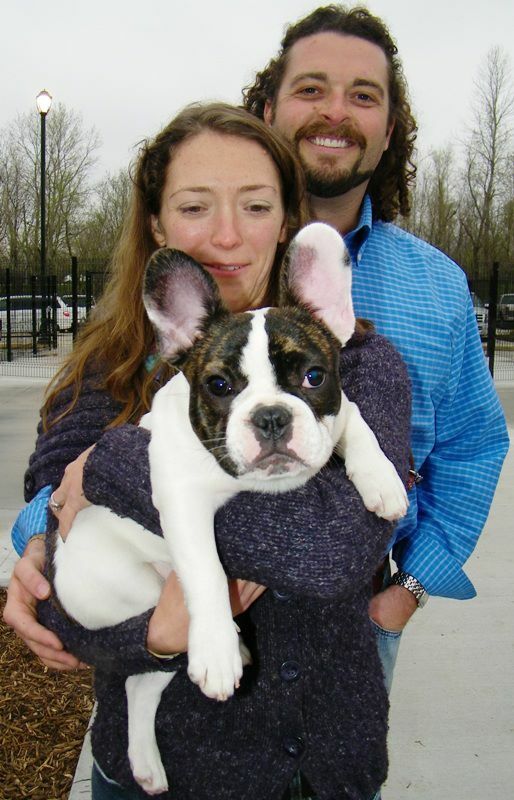 They breed French bulldog pups, raise chickens, entertain friends, and volunteer with their fellow Kiwanians around the community when not busy in their respective careers. (She’s a chiropractor and he’s a sustainability consultant and entrepreneur.) In addition, Jeremiah was instrumental in the birth of the city’s community garden at Holy Family School, he teaches “green” and organic gardening classes, and has run for city council twice. The two will tie the knot on Saturday morning, Sept. 28, around 11 a.m. They’ll march in with the opening parade, in the grand style of the first-ever Oktoberfest in Munich, and exchange vows by the McKinney Performing Arts Center at the conclusion of the opening ceremonies. Following the wedding, they will celebrate their official union by hanging out downtown the rest of the day, partying with the McKinney community and all the guests in town for this popular annual festival. ← Mickey Mantle World Series – A McKinney Tradition!